President Mahinda Rajapaksa has instructed to restore the public service in the North which was non existent during the period of the armed conflict, Public Administration and Home Affairs Minister John Seneviratne said. He was participating as the chief guest at the opening ceremony of the new Karainagar Divisional Secretariat building recently. The fully fledged two storeyed building was constructed at a cost of Rs 60 million. The minister added that several such buildings were constructed in the North and the East with the intention of extending a better service to the public. Some of the offices are opened to the public and some yet to be opened. He said funds required for the construction work were obtained under credit from the Asian Development Bank and the Arabian Development Fund of the Kuwait Government. They had to be settled with interest. "However, as it is the duty of the government to provide people with necessary facilities, the government decided to adhere to this procedure," he said. The minister said: "As we have provided all facilities to government owned institutions and offices, a duty is cast upon every government employee to give the best service to the public. We have also appointed 43 new administrative officers and a considerable number of management and development assistants to the North to facilitate the State mechanism. As learning Tamil and Sinhala is made compulsory for all State employees, steps will be taken for government officers from the North to work in the South and government employees from the South to work in the North, as a measure to rid the communication gap and promote peaceful co-existence. As the first step towards this, a Tamil administrative officer has been appointed as the Government Agent of the Moneragala district and two Sinhalese administrative officers have been appointed as Government Agents of Vavuniya and Mannar. Vardhani Rubasingham, Additional Government Agent, Jaffna, A.H.M. Azwer, Member of Parliament and Dadallage, Secretary to the Public Administration and Home Affairs Ministry also spoke. 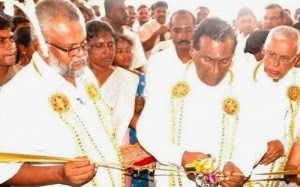 The Karainagar Divisional Secretariat was jointly declared open by Minister John Seneviratne and Traditional Industries and Small Enterprise Development Minister Douglas Devananda. The ceremony was organized by Devanandani Babu, Karainnagar Divisional Secretary.